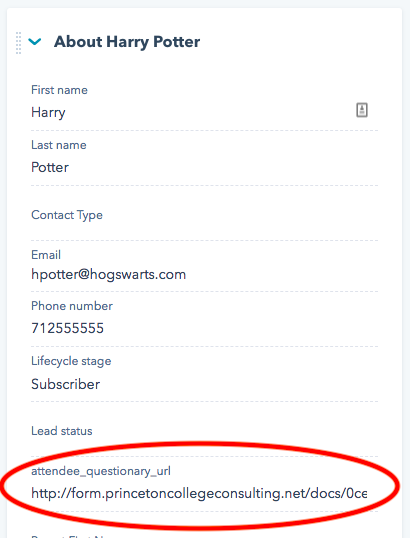 Summary: Locate the contact in HubSpot, scroll down the left side, click "Create Document" in Pandadoc box. How do I find the person's contact in HubSpot? 1. Go to www.hubspot.com and login using your given credentials. 2. In the top search bar, type in the name of the person you want to create the questionnaire doc for. Click their name. 3. Clicking their name will open their contact page. Where can I find their questionnaire answers? 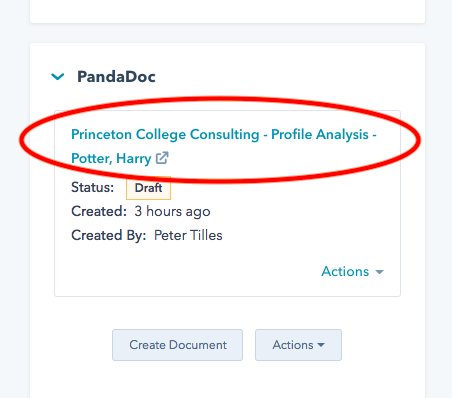 Once you're in the contact page, scroll down until you see the Pandadoc box, and create "Create Document"
Where can I create the Pandadoc Document? 1. Scroll aaaaall the way down the page until you see the Pandadoc box. 3. A new window will pop up. 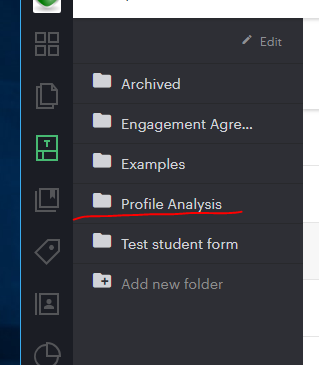 Click the "Profile Analysis" folder. 4. 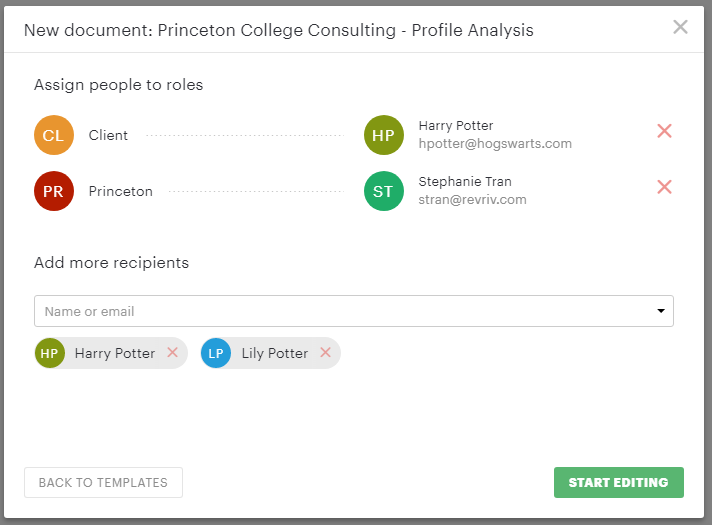 Select the "Princeton College Consulting -Profile Analysis" template. 5. Here, you'll see prompts to assign people to the doc. Continue down this web page to learn how. Begin the editing process by assigning people to roles. This will pull all their answers from their questionnaire automatically. How do I "Assign people to roles"? 1. 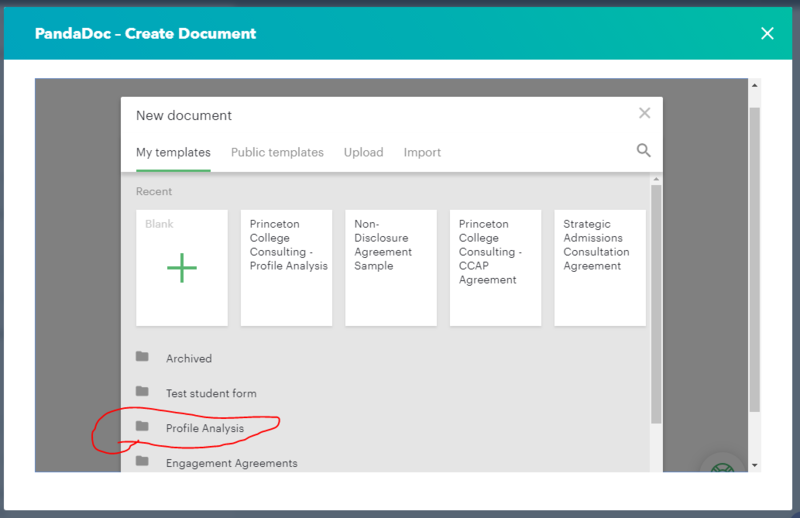 In the first box for "Client," select the student/parent whose questionnaire you are created the Profile Analysis from. 2. In the second box for "Princeton," put in your own information. 3. Add any other recipients who may need to see the Profile Analysis i.e. The student's parent. 4. Click "START EDITING." Your contact's questionnaire answers will now be pulled into this new document. Now you're ready to start! For the cover page, you'll need to change the date (if you're editing the page multiple times) and make yourself the KEY CONTACTs. 1. 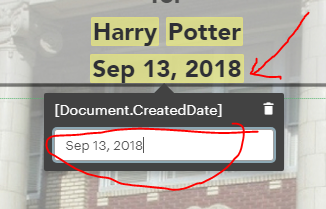 How do I edit the date? 2. A grey pop-up will appear, edit the token in the white box. 2. How do I change the KEY CONTACTS? 1. The entire "box" is a text box, and you can treat it like so. Begin by adjusting the text to suit the correct counselor. Most of it will stay the same, but you can change the name, job title, phone extension, and email. 2. To change the image of the counselor, select the existing image until it has a green border around it, then click "delete" or "backspace" on your keyboard to remove it. 5. 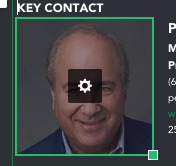 Under the "Images tab, simply select the headshot you want to use. Once it appears, the text may be a bit wonky. Just adjust it with your keyboard like you would in word. If something looks funky, you can always hit "CTRL + Z" to undo something. 1. Starting from RIGOR OF CURRICULUM, how do I edit tokens (the words highlighted in yellow)? As you edit the rest of the template, you will run into blank boxes that you can fill in. As you go to edit the tokens (the words highlighted in yellow), you need to follow this process. IMPORTANT: if you've already added the token value, but need to change it, it's important that you follow this same process. Make sure you click the token until the grey box comes up! 1. Click on the token you want to edit. A small box will pop up for you to fill. 3. Now, wherever else on the document that token appears, it will automatically be filled out! 2. There are boxes and blanks that I don't need—how do I remove them? Sometimes students will fill out the questionnaire before they finish high school. 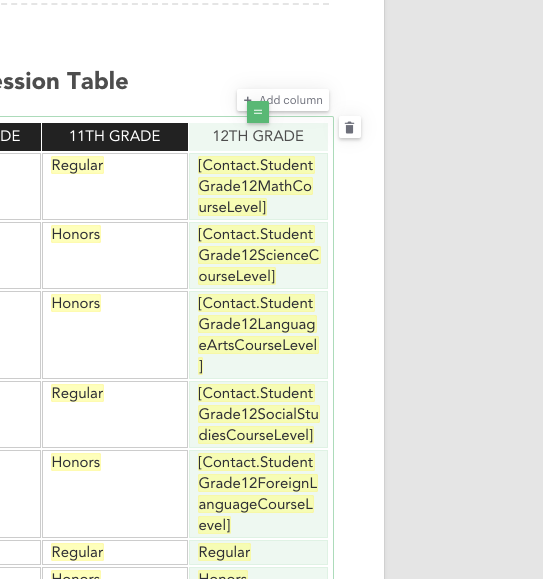 For example, a student who is in the 11th grade will not have information for their 12th grade table. 2. Hover over the table until you see a garbage can icon in the top right corner. 3. Click the garbage can icon to remove. 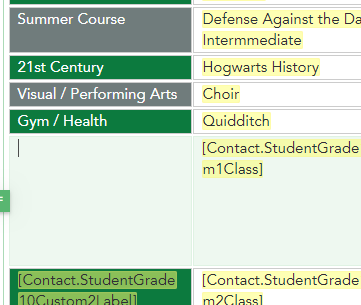 One place you may want to remove columns is in the Course Progression Table. If they have not taken the 12th grade, yet, you may not need that column! Here's how you remove it. 1. Locate the column you want to remove. Click on the very top block until it is highlight in a light green. 2. 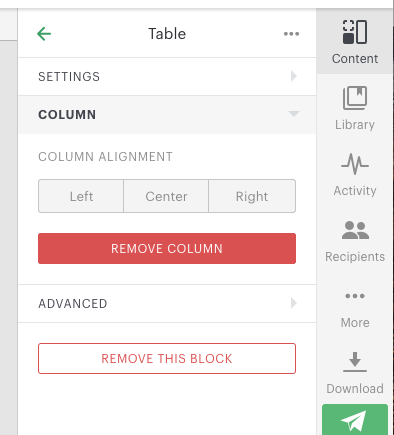 On the right side, you will see some prompts, including a button that says, REMOVE COLUMN. Click the "REMOVE COLUMN" button. If you did this mistakenly, you will see a prompt in the bottom left corner asking if you want to undo. Some tables may have some rows you don't need. Here is how to remove them. 1. Locate the row you want to remove. 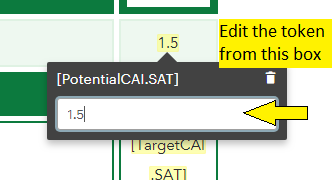 Double-click on the row until it is light green. 2. On the right side you will see some prompts, including a button that says, REMOVE ROW. Click the "Remove Row" button. 3. I need to change the value of a token. How do I do that? 1. Locate the the value that you want to update, click twice (slowly) until the grey box pops open. 2. Edit the value in the gray box. 4. How do I remove content in multiple boxes? 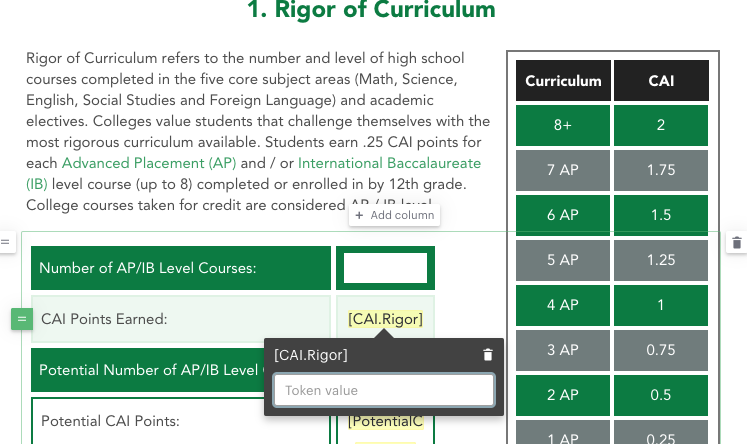 In some cases, you may want to keep the actual row/column/table, but during your meeting with the student, you may want the token information to be gone, but the box to be blank. That way you will be able to fill in the boxes during your meeting. 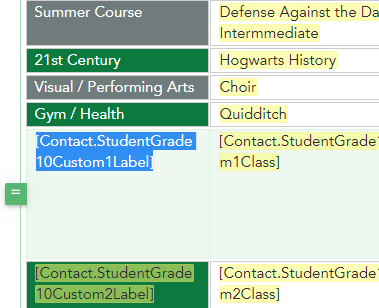 In Harry's 10th grade Course Progression Table, we want to keep these two bottom rows, but remove the tokens and make those cells blank. Then during our call with him, we want to fill them out with information he tells us on the call. 2. Click on the table once to indicate to PandaDoc that we are about to edit the table. 3. Click on the cell you want to clear out. Highlight the information in the cell. 4. (If using a PC) Push the "Backspace" key on your keyboard OR (If using a Mac) push the "Delete" key on your keyboard. It will clear the cell. 5. Repeat for all the cells you want to clear. 5. I accidentally deleted the token! How do I put the token back? 1. Click on the box where the token had existed. 2. Use your keyboard shortcuts to "Undo" until it comes up again. If on PC: On your keyboard push CTRL + Z. Full disclosure: this is a real pain. Values in square brackets from templates are converted to tokens only on document creation. Meaning when you created the document at the contact level in HubSpot. It means that if you've deleted a token in a document, then the same phrase in square brackets won't be converted to a token on the fly. You're much better off just hitting the "undo" keys on your keyboard if you've just deleted the token, but if that's not the case, there is a workaround. However, I would recommend you reach out to Stephanie Tran at stran@revriv.com for assistance. It's better that she just does this for you. 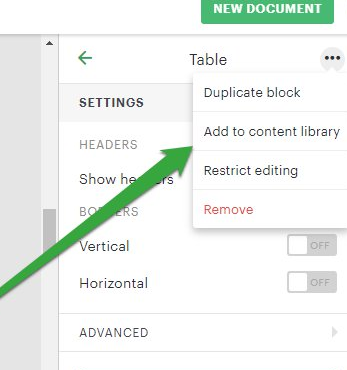 If you wish to try this yourself, what we will do is add a content block with the token you need to put back in and replace your current content block with the new one. 1. Go to www.pandadoc.com and login. Go to "Templates" on the left side. 3. 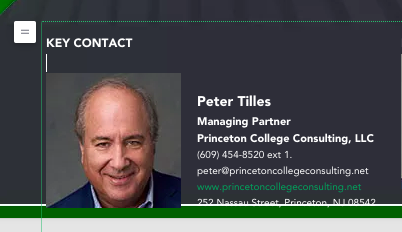 Open the template titled "Princeton College Consulting - Profile Analysis." 4. Select the block where you've deleted the token. 5. 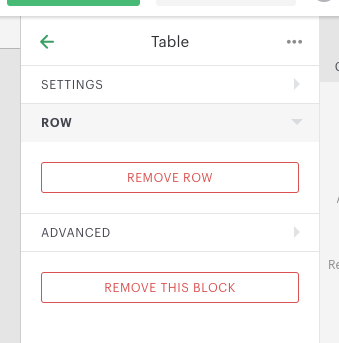 Click the "More" button in the block settings. It's 3 dots. 6. 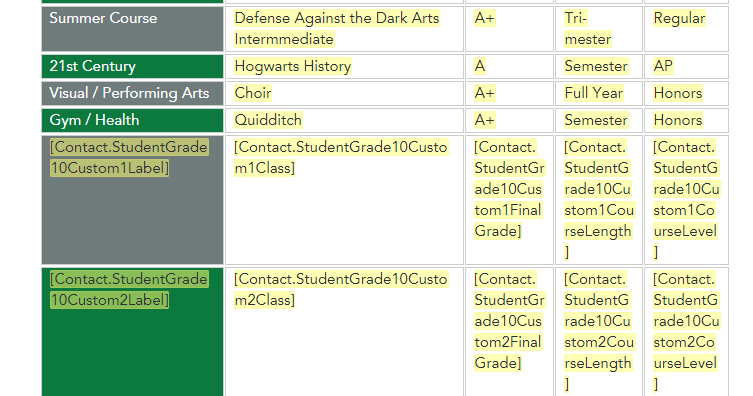 Open your student's Profile analysis from HubSpot. 7. Select the block with your missing token and replace it with the new content block you just created. 1. If you just removed the token by accident. After you've completed the document, you will be preparing to present it. Here's how to open up the document to edit it with your student and/or parent(s). How do I open up the document to present? 1. Navigate to your contact record as you did before, and scroll to the bottom until you reach the PandaDoc box. There, you can open up your draft. 2. Once your document has loaded, clear the clutter on the right side by clicking on the "content" icon to center your document for presentation. Answering the Question: Where Should I Apply to College? College Admissions: Do You Know Your Chances To Get Into College? Princeton College Consulting is a private college counseling practice providing college admissions assistance and athletic recruiting services. To maximize the probability of students earning admission and scholarships to top choice colleges while also minimizing stress and anxiety throughout the college admissions process. Copyright © 2019 Princeton College Consulting. All Rights Reserved. None of the Trademark holders are affiliated with Princeton College Consulting, LLC.